Concealers: does my spot look big in this? ONE Rimmel Match Perfection concealer: For years, I though YSL’s Touche Eclat was the only highlighting concealer for me. But one of the brilliant benefits of writing a beauty blog is that it encourages you to branch out and try a rake of different products at different pricepoints. Sometimes I am pleasantly surprised. And sometimes, like with this Rimmel concealer, I’m delighted. I read about this on the Skinni Peach and picked it up at my local chemist; I think it cost me €7/8. It’s perfect for dark circles; not too heavy, not too light. I use it alone if I’m wearing a lighter base, and on top of a cream concealer if I need more help. TWO Bobbi Brown Creamy Concealer and Corrector: Basically, the bomb. The only thing I don’t like about these products is the price. There’s a full review here so I won’t ramble on, but this combo is pretty much my HG of concealers; the only reason I still shop around is because I’m hoping to find something equally good, but less spendy. And 'cause I'm fickle like that. THREE Benefit Erase Paste: This product has legions of fans but for some reason I just can’t get on with it. It’s very thick, and I find it trickier to smooth across my eye area than I’d like. I feel like I’m dragging the skin a little, which is never good. It’s quite pink, too, and I prefer a more yellow toned concealer. It’s about €25-€30, so pricey, too. FOUR The Balm TimeBalm: I hear mixed reviews about this one, but I’m a fan. It’s less creamy and a touch more drying than either the Bobbi Brown or Barbara Daly products, but it does a decent job on my dark circles and on any blemishes. I picked this up in A-Wear and think it was around the €15 mark. There are 6 shades, and the product comes with a little sponge, which I binned, preferring to use a brush or, more often, my fingers. FIVE Barbara Daly Concealer: When the lovely Rachelle from DollyRouge heard that my local Tesco didn’t stock the Barbara Daly range, she very kindly sent me this to try out. And I love it! It’s a thicker consistency than Bobbi’s, but if you want a creamy concealer that won’t break the bank, this is a fab alternative. Works well for undereye circles and on blemishes. Oddly, I find it melts off the sides of my nose, so perhaps not good for oilier areas. Comes in at around a fiver. SIX Smashbox Photo Op Under-Eye Brightener: Light reflective, shimmery peach liquid for use under concealer; similar to the Bobbi Brown corrector, but designed specifically to work well in photos. I like this product but I don’t reach for it that often: I’m too lazy to add a step to my day-to-day routine, and for special occasions or when the big guns are required, I usually reach for the Bobbi Brown product. Which is sad, because this deserves more love. SEVEN Bourjois Brush Concealer: Another resounding ‘meh’. This is too lightweight for me: the formula is much thinner than the Rimmel product and it doesn’t conceal my dark circles or illuminate the area very well. Comes in two shades and was, I think, around a tenner. What concealer is in your makeup bag right now? And as my Bobbi Brown products are running dangerously low, do you have any recommendations to knock it off its throne?! I have the Barbara Daly one and it just cakes on me (oily skin), while it has the perfect consistency and coverage strength, I can't get along with this. A tube of cheap 'n' cheerful Maybelline's Dream Lumi Touch is my concealer of choice these days. I say choice, but really it's more by way of financial necessity. It's not bad all things considered but there are days when I reckon a burkha would work better. Pre-divorce-financial-fall-out, Bobbi Brown was the business. 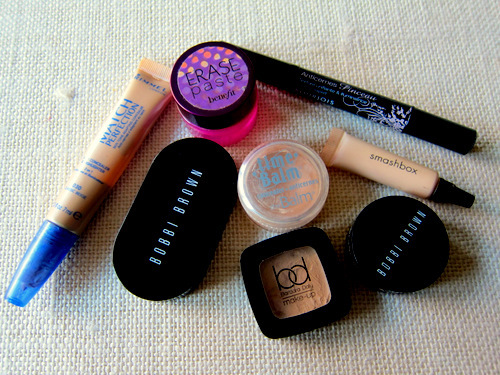 My fav is Mac Studio Fix - It hides everything! I switch it up between EL Doublewear concealer, BD for tesco and Bo-ing by Benefit. 'Estee Lauder's 'disappear 'smoothing creme concealer. I discovered this when I went in to Frasers in a blind panic after my new baby had disallowed sleep for 7 months in a row. My skin was a riot, my eyes were a mess, i had lines i had never known before and apparently i was to be grateful as i had a beautiful baby girl. Ha. This combats all three - not amazing on blemishes admittedly (not bad, just not amazing) but dark circles and fine lines? Disappear is right. They tried various cosmetics on me that morning sensing a demented young mother with money for burning in sheer desperation: from benefit, to MAC, to YSL to whatever else. But this one won. Hands down. This was the bhad boy that meant when i returned to work everybody refused to believe my tales of interrupted sleep (right up til she was two freaking years old!). Have tried it every which way Johanna but while I know it works wonders for others, it just doesn't do it for my skin type I'm afraid!